They didn't really flesh out characters and develop a story for LJ and FA. I think they wrote details about the originals on scraps of paper and pulled them from a hat. Its been described as a relay race of directors. Johnson (although stole the plot of ANH basically) set things up and past the relay onto Johnson - there was no direction. At least in a relay race the overall goal is to finish the race - Johnson took the baton and threw it away then fell flat on his face. JJ is picking the baton back up and is trying to get to the finish line. Not sure if he can do it and be successful. The point is there is no overall story arc - they are making this up as they go. Even rushing out movies, you'd think they would have an overall direction of where they want this trilogy to go, at least the overall big picture story and then spend time on the details of which per movie - what we got is complete illogical nonsense. They made it up as they went along. I'm sure Lucas had plenty in his head for overall Galaxy lore, etc. But the actual story meat-and-potatoes that we all love was done movie-to-movie and even during production they massively changed things. Ewoks were going to be lizard-like and creepy but Lucas himself changed it so they could sell more toys. Solo was supposed to die in the "Harrison signed on for one more" storyline for RotJ. Lucas again felt toy sales would be affected. He modified so much of the story over the six years because of how much money he made off New Hope merchandising. But it did flow easier than the new ones. There was a story arc for the OT to the point where it was to big he split it all up into 6 movies (including the PT) the story was lose but was there, the devil in the details were not all fully fleshed out. He convinced Solo to return for ROTJ, but overall the story could have progressed without his character if needed - the main story (which Lucas has always said Star Wars was about) is the Skywalker family. The entire story OT and PT is about the fall and redemption of Anakin/Vader. It was a story of good over evil and love. This new ST has nothing to it - hot garbage. WIN/WIN to me.. No offense Adam, but man you were/are the victim of HORRIBLE writing. Just proves that you can't out-act the script. Now I understand why shortly after TFA was released, Daisy said she would fulfill her contract but had no interest in continuing after sw9. She knew it was dreck..
Like so many actors, who don't want to be known by just one movie role. Who could blame her, or the rest of them. Yep, it's a job to them, on to the next. They are really doing all they can to draw an audience. Dominic will bring LOTR fans, Matt Smith will bring Doctor Who fans..
Maybe George Lucas will bring SW fans? lol. I'm sure he was given up. "I think everyone has perhaps taken that as me going, 'I don't want anything to do with it,' which is vastly untrue because this is awesome." But sure, she thinks it's dreck. Right. I would do anything for love... But I won't do that. Isnt this movie old news? I have to say, I do not envy JJ with E9 - yes the franchise has seen some big failures since TLJ, and Disney recognise that. They have to do something with E9 to appease the fans that strongly disliked TLJ. However, if JJ goes too far he may upset the fans that liked TLJ in the process. The scales of balance are precarious for E9 indeed. I think the issues that Johnson created with TLJ run deep and certainly will not be an easy fix. If I didn't play swgoh, probably I would like to boycott it and don't go to the movie. 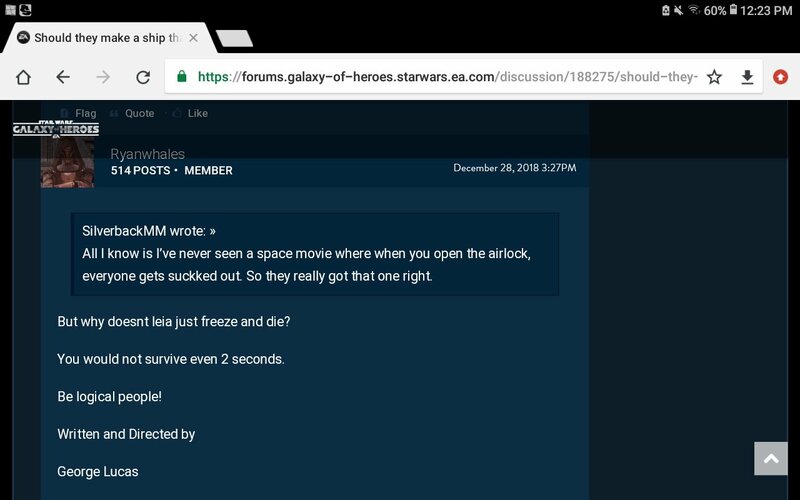 You have to go to the movie because you play swgoh? That's weird. I'm not going to ever watch Rebels just because I use Phoenix in TW. Actually I don't take cartoons seriously (by the way Thrawn is more practical ) , it's just is and it doesn't cause such weight. I woudn't like to read about spoilers and not knowing new characters entering to the game or not having opinion about the new movie when I'm surronded by such community. I hear ya - I like to the have a personal opinion on the characters that enter the game, whether I want to enjoy that character and take the time farming them. Which is why my Holdo, Rose Tico and the crew from Solo remains weak in my roster. Having said that, Holdo will soon likely be given a capital ship for the Resistance team and so I'll have to bite the bullet on that one. Lazy writer! lol - says it himself! Just a reminder, this isn't a "bash Rian Johnson" thread so let's get back on topic here.